We are a Discount School Supply Store Offering Great Prices on School Supplies, Educational Products, & Much More! Thousands of discounted school supplies and educational products. Browse our extensive collection of teaching and learning resources, educational toys, and classroom materials for kids of all ages. 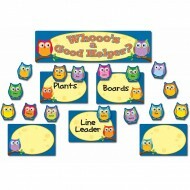 We are your one stop teacher supply store for all of your classroom, nursery, daycare and learning center needs. If you're charged with educating and entertaining kids all day long, then you deserve to have as many school supplies available as possible. With the help of KidsOrb, a premier discount school supply company, you can stretch your scarce dollars further and get the materials to do your job right. We want to make everything easier for you so that you can focus on what matters: your children. Our teacher supply store contains almost everything you could want, so take a look and see what you think. When back-to-school season approaches, you'll want to stock up before the little ones arrive. 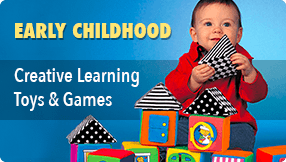 With our fine educational games and toys, you'll be able to delight them while at the same time expanding their minds. Decorate your classroom to make it a treat for the eyes, and students will eagerly look forward to days filled with learning. Here at KidsOrb, our focus is on pre-K through middle school classes as well as child care organizations. By catering to this specific niche, we hope to be able to offer you specialized products that are appropriate for children of the ages you actually interact with. Toys for infants probably won't appeal to your rapidly maturing charges while material designed for high schoolers is likely too advanced for them. 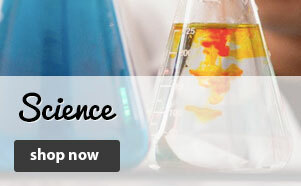 Hit the sweet spot by choosing us as one of your teaching resources. Promote a culture of reading with attractive books that feature colorful illustrations and won't overtax the abilities of youngsters. Introduce them to the arts with our craft supplies, CDs and musical instruments. 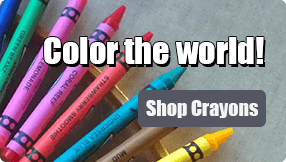 Unleash the creativity within almost every child with crayons, markers and colored pencils. We know that there's a lot of miscellaneous equipment that most people don't think about but that's vital in running a classroom. Floor mats, bean bags, mounting tape and stop watches are just a few of the teacher supplies that await you within our inventory. 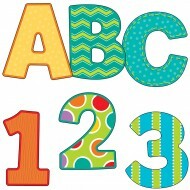 Our classroom supplies are durable and adhere to high standards of quality. We've carefully selected each item for its inherent usefulness and the reputation of the manufacturer. 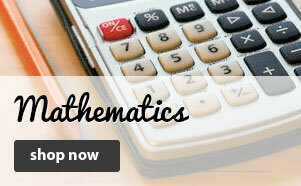 Besides allowing your pupils to have a good time, our discount school supplies also challenge their minds. Our flash cards, math games, hands-on science equipment and fact-filled wall posters mean that they'll be learning more about the world every day almost without even trying. 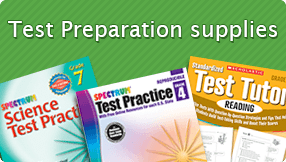 Check out our test prep supplies so that your class will be able to pass with flying colors. Allow KidsOrb to serve as your discount school supply provider, and you'll soon receive what you've always wanted for your classroom. Our desirable school supplies are reasonably priced, rugged enough to hold up under daily use and sourced from some of the top brands around. As a trustworthy teacher supply store, we'll do everything in our power to put the right tools in your hands so that you can deliver enjoyable and rewarding classroom experiences to our future citizens. Call or email us today to find out more. Quick and efficient purchase and delivery. It was so easy to browse and select. Payment was straight forward and delivery was perfect. Faultless.